This bright, spacious home lives like a ranch with main floor master & laundry. Natural light floods the living room with soaring ceilings while view windows bring the outside in & gas fireplace keeps the space feeling cozy. Open floor plan with bamboo wood floors flows to the dining & kitchen. Chef's kitchen features two islands, prep sink, granite counters, stainless appliances & plenty of storage. Retreat to the master suite with double vanity, large shower and walk-in closet. Second main floor bedroom is adjacent to a 3/4 bath, while upstairs bedroom has a new en suite 1/2 bath. Walk-out lower level has a family room that is a great spot for games or movies, 4th bedroom and attached bath. The spacious bonus room has built-ins, a closet and egress window, allowing it to be used as a 5th bedroom or office. 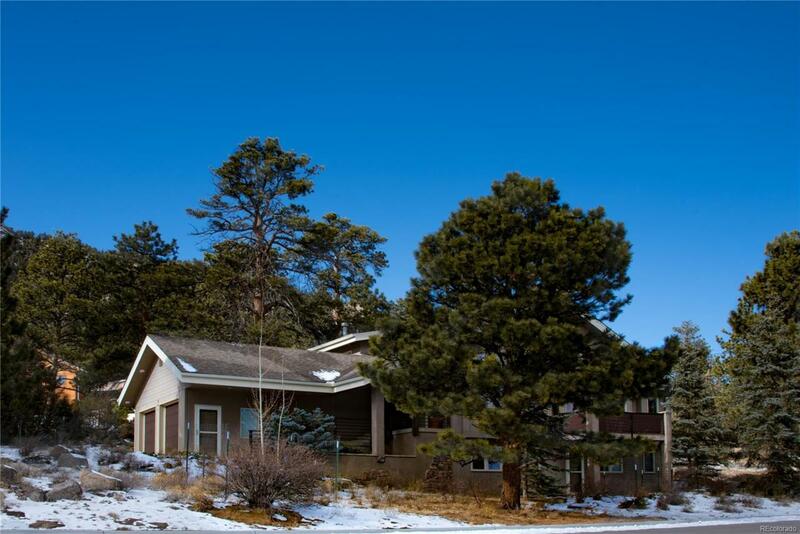 Nestled in the trees, on a cul-de-sac with rock outcroppings & mountain views making this an ideal mountain home. Offered by Coldwell Banker Estes Village Properties.